Friday, Dec. 28, 1888 Mercury 12°+ this morn, 26°+ P.M. quite pleasant & some less wind. 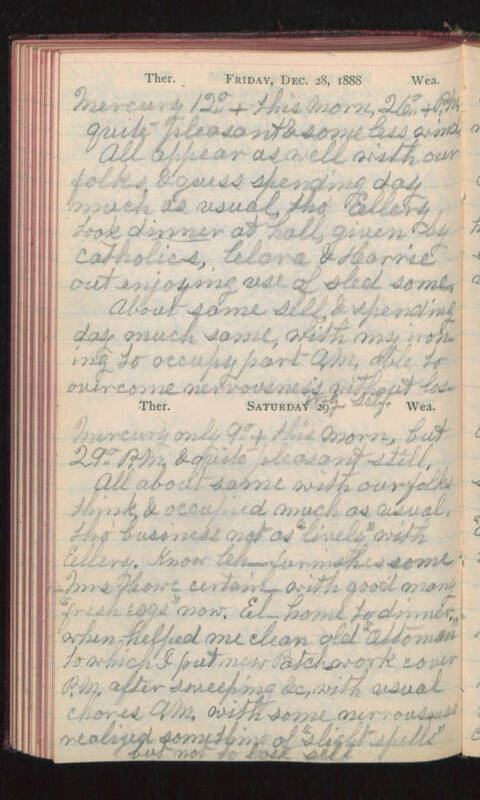 All appear as well with our folks, & guess spending day much as usual, tho' Ellery took dinner at hall, given by Catholics, Clara & Karrie out enjoying use of sled some. About same self, & spending day much same, with my ironing to occupy part A.M. able to overcome nervousness without losing self. Saturday 29 Mercury only 9°+ this morn, but 29° P.M. & quite pleasant still. All about same with our folks think, & occupied much as usual. Tho' business not as "lively" with Ellery. Know Ch- furnishes some Mrs Howe certain with good many "fresh eggs" now. El- home to dinner, when helped me clean old "ottoman" to which I put new patchwork cover P.M. after sweeping &c, with usual chores A.M. With some nervousness realized something of "slight spells" but not to lose self.